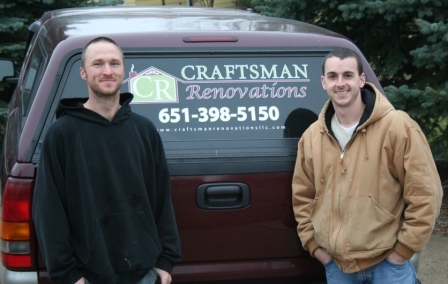 Mike Faletti and Mike Dexheimer founded Craftsman Renovations because of a mutual ambition to create a company which prides itself on quality affordable construction; where the customer’s needs truly are put first. Over the past two decades Mike “Dex” Dexheimer has been working in the carpentry and construction industry; honing his skills and learning the trade. Dex has continued to enhance his skills with years of on-the-job-training and by attending numerous training sessions and earning certifications from programs such as the American Lung Association’s “Health House” and EPA’s “Lead Safe.” Dex’s favorite part of remodeling is taking a customer’s vision and crafting it into a reality. In his spare time, Dex enjoys remodeling his Craftsman bungalow in Wisconsin with his loving and supportive wife, Jill and his three “carpenter in training” daughters, Calla, Elena and Leila. Mike Faletti’s passion for the building arts began during his high school drafting class. He went to College at Saint John’s University in Collegeville where he graduated with a Business Management degree. During his college years he spent his summers doing maintenance for a town house association. He has been working in the residential remodeling industry full time since 2003 and loving it! His favorite part about remodeling is coming up with creative solutions to clients’ space issues. Mike enjoys spending time with his wife Desi and four beautiful children: Andrew, Annelise, Alayna and Adam. The A Team! U.S. EPA as a Lead-Safe Certified Firm.